Toiling away on a project like Sembl can be lonely, so I was chuffed this week to make an acquaintance with Metamaps – or more particularly, Ishan Shapiro, one of its founders – and to discover some shared heritage. Sembl is a descendant of the Glass Bead Game, and its purpose – or one of them – is to foster collaborative sensemaking. In its first form the game aspect of Sembl dominates its role as a sensemaking tool. 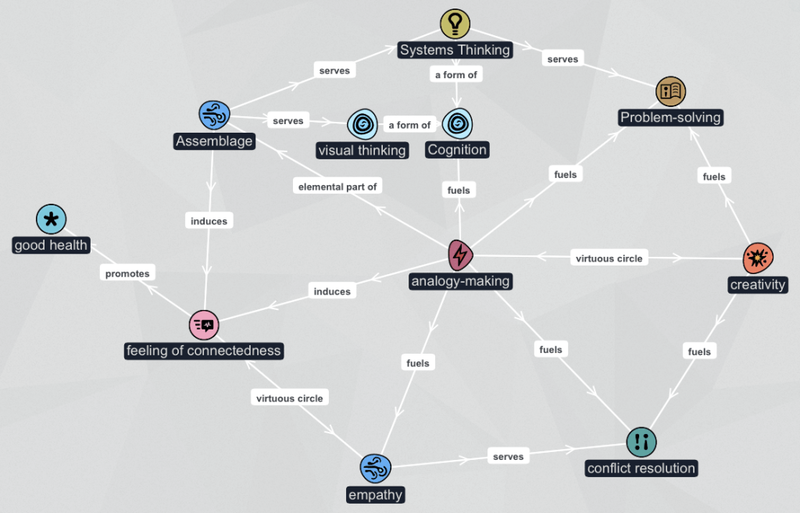 But part of the reason I adopted this mission to bring Sembl into being was that I’ve been disappointed by every single mindmapping tool I’ve ever tried – because I want to be able to handcraft my own connections between nodes. For me, generic linking is a major limitation of most mindmapping software because the juice of a story is in the quality – and the nuance – of the relationships between the nodes. So my plan for Sembl has always included a de-gamified version, for personal or collaborative non-linear storytelling. I’m sharing a static PNG here because I wanted to show it with all the relationships visible. But (assuming you have requested and received access to Metamaps) you can see – and adapt! – the live version on the Metamaps site. It’s a small world. I’ve been following the Metamaps community group at https://plus.google.com/u/0/communities/115060009262157699234 for more than a year. At http://metamaps.cc/maps/430 you can see an attempt to covert a strategy map done using cmap tools, see http://tinyurl.com/tmc-strategy-map , into the metamaps format. For me these are exciting tools, but without the manpower I have difficulty adopting them to my own uses.